Puah’s young arm muscles burned with strain. She was doing her best to help bear the weight of the pregnant woman who was in the final stages of labor. They had helped her squatted upon the birthing stones while Shiphrah knelt underneath her to catch the newborn baby. Puah and Rania stood on either side of the woman with a grip on each of her arms for support while she pushed. This was not the first time Puah had assisted with a birth, but it felt like it. “Push, Leora!” Shiphrah shouted from beneath the pregnant woman. Her mentor, Shiphrah, told Puah that with time her arms would build up strength. Apparently, three years had not been long enough. She adjusted her feet to spread the weight over her body like Shiphrah showed her. The movement helped. 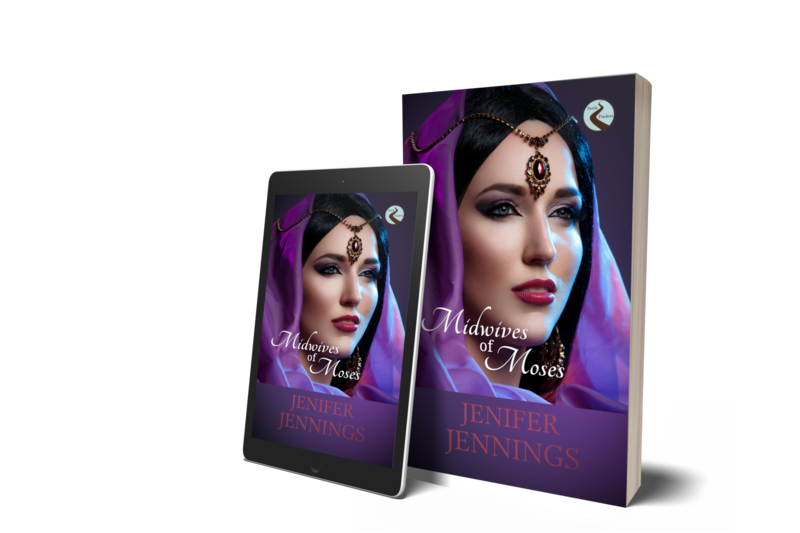 She glanced over the pregnant woman’s head to Rania, another midwife apprentice holding the woman’s other arm. She must be struggling with the weight as well because her face was scrunched as if she was the one in labor. Her copper-toned skin was shifting to tones of red. She held her bottom lip between her teeth and her strict focus was on the woman between them. The pregnant woman was a Hebrew not much older than the two of them. This was her first delivery and she had called for the best midwife in all Egypt, Shiphrah. Puah had the great fortune to seek out mentorship under Shiphrah. She had just advanced her last two apprentices and was in search of fresh young girls to train. One Hebrew and one Egyptian. Puah had been the selected Hebrew and Rania was the Egyptian. Shiphrah believed strongly in giving equal training to both groups of women. A practice most unheard of for either culture. Though both enjoyed living in the same land, they were not melded as one. Each remained distinct in almost every way from the other. Even after three hundred years, Puah’s people held to their identity as God’s chosen ones. Being the youngest in a long line of girls, Puah knew her family wouldn’t have the resources necessary to offer a lavish dowry for her. At the age of twelve, she sought out Shiphrah to train her as a midwife. At least she could put her hands to some kind of good service. Puah looked down. She noticed drops of sweat on her mentor’s wrinkled forehead. Her dark brown hair was also weighed down with dampness. She also noticed that her hands were too preoccupied widening the pathway of delivery to wipe her own brow. Her burnt cinnamon eyes were transfixed on her task. Puah thought if a sandstorm had blown up in the room, she didn’t think her mentor would even blink. The young midwife in training glanced over at the pile of clean linens that Shiphrah had expertly stacked within reach. It crossed her mind to grab one and pat her mentor’s forehead. The burning in her arms caught her breath. She feared if she released her grip even for a moment, the woman would topple on the birthing stones. Rania was of the same age and strength. She knew the girl could not bear the weight alone. The pregnant woman grunted and bore down hard. Shiphrah had delivered hundreds of babies. She made the duty of helping women bring new life into the world look as effortless as breathing. Leora’s scream brought Puah back to her task. She dared a peek between the woman’s legs. She saw a dark-haired head slowly appear and then, just as easily disappear back inside its mother. She looked at Shiphrah with wide eyes. Puah watched her intense gaze on the opening. “Just…like…father…” the pregnant woman joked between labored breaths. “What happens next?” Rania asked from the other side of the pregnant woman. The two young girls tightened their grip on the mother’s arms to help keep her stable. Another scream erupted from Leora’s mouth. “He’s here,” the midwife shouted with glee. She held up the shimmering, olive-toned wiggling boy. “Praise God,” Leora said as she collapsed into the arms of the two women helping support her body. “He sure is,” Rania commented. “Thank you.” Leora grinned. She sighed with relief as the two apprentices helped her to a waiting pile of pillows. The older midwife laid the boy on his mother’s chest to enjoy his first meal. “Another healthy Hebrew,” Puah commented on their way out of the house and into the open streets of Avaris. “We don’t rip anything from anyone,” Shiphrah corrected. “Where are we going next?” Puah asked. The three women stopped at the entry gate so Shiphrah could knock. A woman in a modest dress answered the door with a bow. Puah could tell right away she was a Hebrew. Some women worked as servants for their Egyptian counterparts. It was a good wage. It wasn’t an ideal situation, but often times a necessary one. “Greetings, Ziva. Is your mistress home?” Shiphrah asked. It always amazed Puah at how easily the older woman could switch her speech from Hebrew to Egyptian and back again without missing a single word. She was sure it was only one of the countless reasons so many women called upon her. As they were guided down a long entrance hall, Puah took note of each room they passed. Egyptians and Hebrews lived much differently. Each dressed and spoke distinctly, but it was entering a house in which one could really see the division. The Hebrew home they had come from in Avaris was a small, square design. An open courtyard welcomed visitors. Wood pillars divided the other half of the house into usable rooms. The few rooms were used by every member of the family. There were no paintings or decorations to cover up the simple walls. Very few even contained furniture. The house area was divided into two levels with an exposed rooftop. Homes were set close enough together that one could have a conversation with their neighbor while working on the roof. The lavish Egyptian home stood more rectangular with a massive wall around the outside to close off unwanted guests. The main house held multiple rooms used for various activities such as sleeping, eating, and worship of the family’s chosen deity. A second level was also separated for multiple uses, but it’s top was closed off from the outside. Many were painted or had white limestone applied to the outside to keep the inside of the home cooler against the rays of the harsh sun. Walls and floors of each room were covered with pictures and sculptures. Pastel colors livened up each room. Couches, tables, and storage vessels cluttered every corner. The simple Hebrew eye could easily get overwhelmed trying to take it all in. Puah blinked a few times to clear her vision. As they exited the main house and made their way to the back of the property, she noticed the separate kitchen, well, stable, garden, and servant quarters. It was the kitchen where Ziva led them to her mistress. “Greetings, Anta,” Shiphrah offered when they found the woman of the house kneading dough on a flat piece of wood on the floor. Puah noticed the recently caught waterfowl swinging from the ceiling. No doubt to be the main course of their evening meal. She could smell the fresh blood dripping from its body. It had been a while since she had tasted meat. To her people, meat was a rare delicacy. To an Egyptian, it was just another way to satisfy their hunger. “Greetings, ladies.” The woman wiped her hands on a towel and then placed it over the dough. Ziva stood over her mistress and allowed Anta to wrap her arms around hers. With a cautious movement, she helped lift the woman from her seated position to her feet. Anta was a beautifully radiant Egyptian woman. She wore a lily-white robe wrapped and tied to accentuate her curves, but also allowed room for her rounded midsection to poke out. The red sash Puah had seen her wear on a number of occasions would normally hug her smaller waist and thereby be short enough to spare its material from the ground. With her belly expanded to hold her unborn child, she knotted it under her bulge so that it hung low enough to elegantly sweep the sandy floor as she walked. Pieces of her dull hair stuck to her forehead from under a shiny, black wig. A sign of wealth to any who wondered if the wearer were affluent enough to afford such extravagance. Puah tucked some loose strands of her thick, russet hair back under her head covering. If she lived to be as old as Eve, she would probably never afford such luxuries. Several gold necklaces jingled against Anta’s neck collar as she embraced each midwife. “I’m happy you have come to see me.” She handed each woman a small piece of bread sprinkled with salt. Puah graciously accepted the friendship offering with a bright smile. It was nice to know some Egyptians still tried to befriend Hebrews even in shifting times. The recent Pharaoh change three years prior had caused unease in the land of Goshen with the addition of taskmasters over the Hebrew people. It seemed the new Egyptian god on earth, Thutmose, was going to make a name for himself by expanding his borders at the same time as he was placing more control over the Hebrews. She was glad she had chosen to be a midwife as soon as she was old enough to make the choice for herself. At least she would be spared the life of a house servant like many of her female friends. She observed Ziva who had stayed nearby waiting for her next orders. She wondered what led her to serve Anta and from which tribe she came from in Goshen. The woman stood as still as a statue, though her muscles were tense with anticipation of her next task. Bright onyx eyes were transfixed on her mistress. Gazing around the large backyard, Puah wondered if any of the materials of the buildings had been forged by Hebrew hands. Many young husbands had been sent to hard work in the quarries to help expand the presence of Egyptian architecture in the land. Hebrews were always seen a little lower in Egyptian eyes, but it seemed the new royal family was forcing them to bow even lower. She didn’t have to worry about a husband. The life of a midwife was often solely focused on helping couples welcome life into the world. She understood that part of the calling and welcomed it. No one had caught her eye and she was sure she hadn’t captured any man’s attention. She tried not to worry about the growing oppression either. She was a midwife. Or at least one in training. The guild was held in high regard for their skill in medicine and was considered one of very few groups that didn’t have to fear being forced into slavery. They were too valuable to Egyptians to be placed under thumb. As she chewed, the warm bread seasoned with cumin melted the salt into a divine sensation in her mouth. The hefty scent of stew wafted through the air. Her mouth watered over the salt and delicious aromas. It was the tastes of Egypt that made her heart long to live as they did. Anta glared at her servant who ducked her head. Ziva bowed, grabbed a basket, and left the kitchen. She looked down at her freshly woven sandals. “Less the last two days,” she whimpered without raising her head. Puah and Rania helped the woman into the house and positioned her on one of the couches so Shiphrah could examine her. “What are you going to tell her?” Rania asked. The three returned to Anta’s side. “The baby?” Anta clutched her mid-section. “Or?” Anta raised an eyebrow. “I think we should try to help the baby come quicker. You’re far enough along now. If something is wrong, I can help once the baby is here. If the baby stays inside and we can’t help…” She spread out her palms. “We’ll be here to help,” Puah offered with a pat on the woman’s hand. “How long will Ziva be gone?” Shiphrah asked retrieving the bag she had left at the front door. “She’s worried about you too,” Puah said. She gave instructions to her students to set up the birthing stones while she prepared her mixtures and cloths. “Hard to tell,” Shiphrah called from beneath her. “Stay strong,” Puah said with a tightened grasp on the woman’s arm. “You’re doing well,” Rania added. “Let’s try another big push,” the older midwife instructed. Anta bore down so hard her face turned red. Several moments of agonizing silence hung between the women. The younger women rushed to exchange positions. Puah moved her fingers out of the way while delicately bearing the weight of the upper portion of the half-delivered baby. Anta obliged with a deep thrust. “Hold on,” she instructed her apprentice. “She’s out!” Puah shouted as she fell back into a seated position with the baby in her arms. Anta collapsed into the other two women and released her air. “What’s happening?” Anta lifted herself to see. “My baby!” The mother covered her mouth as she wailed. “Flip her over,” the mentor demanded. Puah carefully, but quickly adjusted the petite baby in her hands. Anta let out a monstrous howl and dropped onto Ziva’s chest. “Please, Lord. Return back the life of this little one.” Shiphrah flipped the baby over and gave a few short breaths into her nose again. She bent over and placed her ear over the baby’s face. Shiphrah tucked her chin to her chest and shook her head slightly before lifting her head to kiss the baby’s forehead. “I’m sorry,” she whispered. “I said leave!” Anta barked. The three midwives walked quietly out of the house and headed north. It wasn’t until they reached the home they shared in Avaris before any of them spoke. “I’ll never get over that,” Puah said, sorrow filling each word. 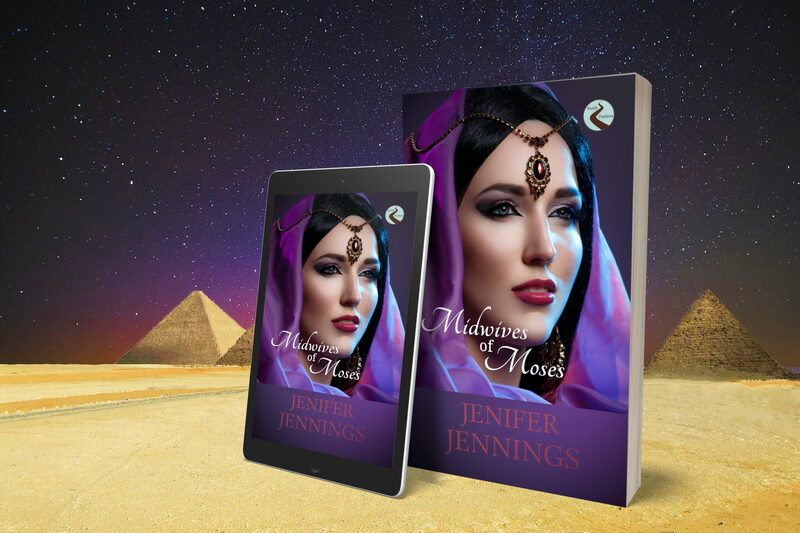 ​Grab your copy of Midwives of Moses for $3.99 eBook or $12.99 paperback. Follow Puah through her faith journey.